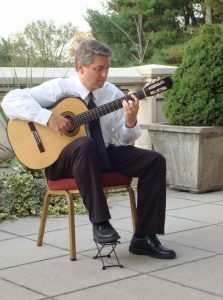 Richard Wylie has extensive experience teaching many different forms and styles of guitar. He currently instructs at Rainbow Music and the Music Mart in State College, PA. Richard integrates his rock, jazz, and classical background to provide personal and insightful instruction to students at all levels. Richard can provide DJ services or solo guitar and DJ packages to enhance your next event, wedding or private party. His unique musical background can cater to your personal entertainment preference. He has performed extensively in New York, Los Angeles, and Washington, D.C. as well as over 15 years of experience in Central PA.